The words, ‘I’ll just have a salad for dinner’ may sound boring for some. I love, love, love me a salad at any time of the day. Love how the kale makes this salad feel more substantial and wholesome. Not to mention the extra texture. Of course with plenty of bacon and parmesan and a poached egg it ticks both the ‘delicious’ and ‘satisfying’ boxes. 2. Quick Halloumi & Rocket Salad. For those of you not living in Australia, no this salad doen’t include an edible space craft. It does include my favourite peppery salad leaf, known as rocket here (based on the French ‘rocquette’) also called ‘arugula’ in Italy and other parts of the world. Whatever you call it, this salad is a winner, bursting with flavour, freshness and the comfort of grilled cheesey halloumi. 3. Quinoa, Feta & Avocado Salad. It’s got the substance of quinoa, the creamy richness of avocado and the salty tang of feta. Dinner is served. Although if you have a little more time and are after a hot dinner, this Warm Salad of Roast Cauliflower & Quinoa might be more your style. 4. Smoked Salmon & Chickpea Salad. Love how the smoked salmon makes this salad feel luxurious. While the chickpeas keep it grounded and filling. Also love how canned chickpeas sit happily in the pantry and smoked salmon will keep in the fridge for months making it practically a pantry meal. 5. Chinese 5-Spice Chicken Salad. Saved from being another boring chicken salad by the exoticly flavoured Chinese 5-Spice blend, a little chilli and a squeeze of lime. An oldie and a goodie. Perfect for those nights when one of your feels like steak and the other wants a salad. Everyone happy. A good reason to always keep a packet of peas and some bacon in the freezer. Just pickup some leaves and a bunch of mint on the way home (or from the garden) and dinner is minutes away. 8. Quick Warm Chicken & Parmesan Salad. Because you can never have too many fast chicken salad recipes up your sleeve. 9. Roast Mushroom & Bread Salad. From my pre-diabetes / low-carb days. If you love sourdough and mushrooms, this salad could be your new favourite! See the Salads Recipe Index. 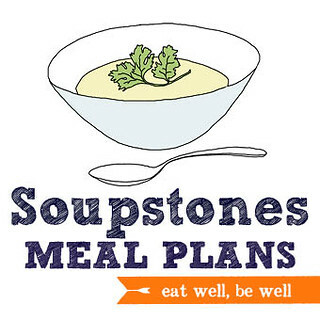 Then check out Soupstones Meal Plans. It’s a weekly meal planning service where someone else comes up with the ideas for what to have for dinner.